These people genuinely feel more like foxes, dragons and cats than they do humans. Otherkin are people who identify as partially or entirely non-human. A dragon, a lion, a witch, a fox – you name it – there is probably someone out there who feels like they are more these things than they are human. The otherkin community can be found lurking on Reddit, Tumblr, TV Tropes and other online forums. The popularity of the otherkin phenomena seems to have been steadily increasing – particularly on Tumblr – since 2012. But what does it mean to truly believe you're non-human? Do people genuinely wake up one day and think that they are a fox or is this just a bizarre form of escapism? Is it body dysmorphia or fantasy? I spoke to John on Reddit, a 19 year old from Knoxville, USA, known on the web as Noslavic. 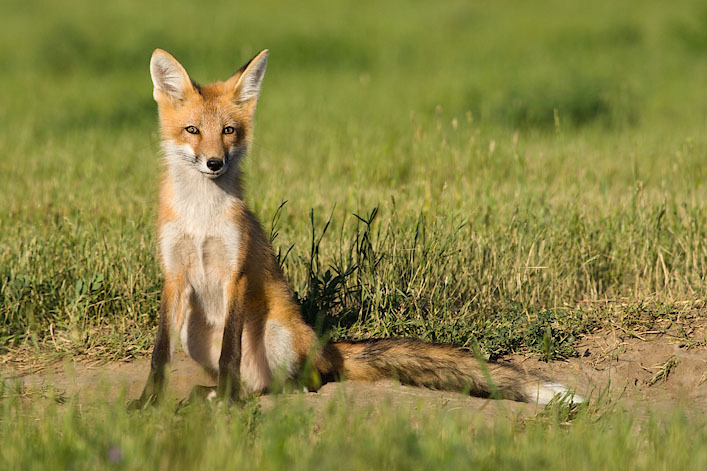 He introduced himself: "I am a red fox-kin who was, as we call, awakened about a year ago." He said that awakening felt "at the very least, relieving" because "everything seemed to come together for him". "I started getting odd dreams where I would change physically into a fox and they were very realistic – honestly. And after a while, in real life, it felt quite real, like I actually had a tail, I actually had ears, I actually had paws. Sounds a bit like an elaborate horror story, kinda like Kafka's Metamorphosis or Cronenberg's The Fly, but the sensation John experienced with his tail has been identified by scientists as possible, and compared to phantom limb sensation. "I feel a special connection with the lion. I feel like I demonstrate many of the same characteristics as the animal. It's mostly a secret in my day-to-day life, but the traits that I share with lions do help me. In pagan religions of the past it wasn't uncommon to believe that humans would be reborn as animals, so the idea that I was, in a past life, a lion, is not as far fetched as some would think." Ri Na Gach's tattoo: "It's a tribal running lion. It symbolises my connection with lions and my Leo sign." Fiona or Feef, 34, and from the UK, is not otherkin herself but participates frequently in otherkin forums: "I know some otherkin very personally and it's very hard to put into words but you can tell there's something different. It's not something tangible, it's just a quality about them." Feef searched long and hard but never "awakened": "I tried a lot of the kinds of experiences people were talking about like guided meditation but I just didn't get anywhere near," she tells me. Instead she defines herself as a Furry: the definition of a furry is not fixed but it is generally thought of as someone who likes fictionalised anthropomorphic figures and dresses up in fur suits. Online, she is called Fionacat, her furry being a European shorthaired house cat: "I first developed the character back in 1996 or '97 and at the time I was just looking around for something fun, and I found this furry thing and was like, 'Ooh, I like the sound of that!'" Of the 11 online otherkins I got in touch with, only about three maintained that they were openly otherkin in real life. As one, Dragonkin Azurel explained, "My dragon persona lives strictly online. I believe myself to be entirely human, but online I like to stay as perfectly in character as I possibly can." There does seem to be an appeal to creating another self, another identity which no one can judge you for online. It's an opportunity to try out your acting skills, to release some creativity in an anonymous space. "It's kind of the anonymity," Feef tells me, when I ask her if this is the case. "You get to be anonymous, but rather than being anonymous, you get a distinct personality behind what you're actually saying." It would seem, from reading otherkin message boards, that a significant percentage of otherkin are also transgender, and there are many forums online arguing that if you support transgender rights, you ought to support the rights of otherkin. Feef is transgender and can "personally see the correlation between transgender and otherkin". She explains that, like transgender people, some otherkin do feel dysphoric with their human bodies, "they want to become more like that animal", just like how some trans people want to alter their physicality. Some otherkin actually have surgery to look more like their animal or creature, Feef tells me. "I do know some people that have done that and yeah. It just doesn't look that amazing." I ask Feef if the fact that she is transgender and already has a fluid conception of her identity could be what attracted her to the whole idea of otherkin. "I would say that is actually a fair assumption to make," she replies, "but the same thing that clicked for my own gender realisations just didn't click for the other stuff... While I could tell that I was never really supposed to be male, there wasn't anything like that in terms of being otherkin." The distinction between otherkin and transgender is frequently outlined by users on Reddit; while there has been controversial research showing that being transgender might be caused by number of physical anomalies in the brain, including a difference in the brain's white matter, no such physical difference can be found for otherkin. While otherkin may protest that this is due to a lack of research, Azurel adds that "it's a significantly larger jump from 'other gender' to 'other species'". Despite having the conviction it takes to make such a big jump, otherkin get a hell of a lot of criticism for their beliefs. One Reddit forum labelled: "Otherkin are delusional and should be treated as such" received 751 up-votes and over 450 comments. Other disparaging commenters compare the otherkin community to religious fanatics and argue that they need psychiatric help. But is this all just fursecution, as some genuinely call it in the otherkin community? Sarah, a 17-year-old fallen-angel otherkin, tells me that she struggles with a number of disorders including Generalised Anxiety Disorder, ADHD and Social Phobia, but maintains that she is medicated and still lives a fulfilling life like most humans. "Some say it's a coping mechanism," she tells me, a way of escaping one's own anguish by becoming something non-human, something without imperfections. Sarah wants to say to people, "You know what? If it is, then so be it." On Reddit forums, otherkin frequently point out that there was once a time where people thought that being gay was strange and that this is just another progression that people are yet to come to terms with. Ri Na Gach agrees, stating that being otherkin is a private matter. "No one can tell me, 'You're a human' and no one could tell David Reimer he was a girl. I'm me, and only I will ever truly know 100 percent who that is." Still, this doesn't stop the bombardment from trolls on Reddit, Tumblr and LiveJournal. Feef notes that the otherkin community tend to react "exceptionally well" to any piss-taking or abuse, adding that, unfortunately, trolls are to be expected; "Whenever people have something different about them, you're always going to find people wanting to make fun of them." Most otherkin seemed to be suspiciously interested in video games and fantasy novels, which doesn't seem like a coincidence, when you consider the element of imagination required for both. Fiona said she could see that, "for a lot of them, video games are a route into becoming otherkin". Customising a character, for example, is just another mode of self-fashioning. Through these video games a certain freedom is created: a virtual fantasy world, a virtual self and an outlet to be your otherkin – to be whatever you want to be. From what I have gauged in my time speaking to otherkin, many admire certain aspects of their kintype (the animal they feel akin to) and seek to develop their own characteristics to mirror this. It's almost like having a role-model within yourself. Azurel tells me about one particular dragon-kin who does his best to emulate what he thinks of dragons – he thinks of them as "wise, thoughtful, thrifty and brave" – so it's an aspirational kind of transition. No one I speak to wants to be a goblinkin.